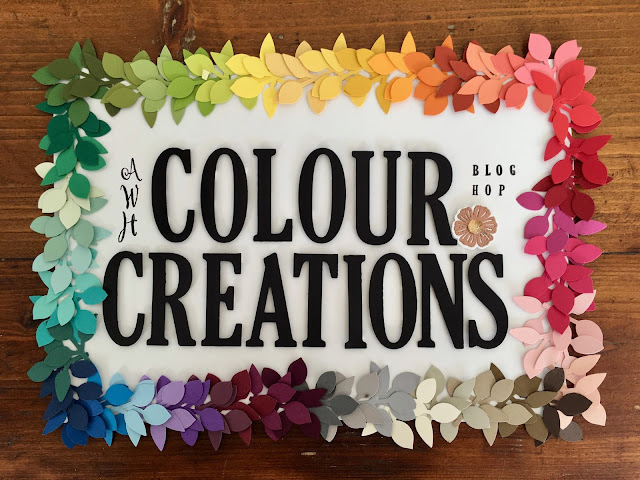 Its time once again for this week's Colour Creations Blog Share. This week we are looking at Lovely Lipstick. It's a colour I haven't used much as it intimidates me a bit! I can't decide if it's a red or a pink! What do you think? Today's card definitely leans towards pink. What ever you think, it's bold colour, and so I toned it down a little with a layer of vellum. I have used a stamp set that was an All Attendee gift at OnStage, called Humming Along. It will be available from January when the Occasions Catalogue goes live. Isn't the flower gorgeous? It's a lovely big bloom, just right for colouring. Does anyone know the type of flower? I'm a bit horticulturally challenged! EDIT: My friend Rachel tells me it's a hibiscus! When we are at OnStage we get to see a lot of different stamping presentations. One which really stuck with me was Dale Hampshire's presentation on colouring for people who have problems with holding markers - maybe they have shaky hands, as Dale does. I've been thinking off and on about other ways to colour. I decided to give smooshing as a method of colouring a go, and I was quite pleased with the results. Do you remember how to smoosh? You basically just transfer some ink to a clear block, spritz with some water, pick up the watery ink with a bendable plastic sheet and then smoosh the sheet onto your cardstock. I was so pleased with the results, and I can't wait to try it with my class ladies! It really is a cheat's watercolouring. I finished off the inside with another of the blooms and a strip of DSP left from the front. The sentiment comes from the Varied Vases set. You may be interested to know that there's a new stamp set to match the lunch in the Occasions Catalogue too! Why not pop on over to Catherine's blog, where you'll find the rest of this week's Lovely Lipstick cards? It's a bold colour, and I can't wait to see what the other girls have done with it. Tina thank you for introducing me to yet another technique. I love this stamp set and your card. Thanks so much for hopping along tonight. Lovely colouring of that flower, Tina, it's beautiful and the vellum layer over the bold DSP works perfectly! Hurry up pre order as I have such a long wish list and only 3 1/2 week until I'm on holiday so I want them all to play with. This card is just so beautiful Tina, I love the vellum layering. Your hibiscus looks fabulous coloured with the smooshing method. I'm going to give that a try too, I think. Looks so fabulous Tina. Love a bit of smooshing - gives such great colour variation. Love your smooshing Tina, it looks fabulous. What a great way to colour if you have shaky hands. I think I am going to give this a try. Na Na Na Na Na Na Na Na Bat Punch!